United Lens Company (ULC) has been a leading manufacturer of optics since our founding 100 years ago. Today, ULC is one of the optical industry’s only vertically integrated companies. We offer a range of services, including a number of optical manufacturing processes performed in our Class 1000 Cleanroom. 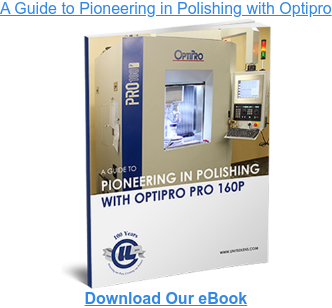 Depending on the industry or application for which a given optical element will be used, it likely cannot be considered complete after shaping and polishing. In order to modify the properties of the substrate material — primarily transmittance and reflectance of light— to ensure precise performance, one or more of any number of thin film coating methods may be required. There are many thin film coating methods in use today. Each method is a type of deposition, wherein a material is deposited onto the surface of an optical element. Broadly speaking, deposition can be performed chemically, using one or more chemical reactions to fuse a layer of material to the optical element, or physically, which uses mechanical force. ULC specializes in three thin film coating methods, all of which are physical deposition methods: resistive source evaporation, electron beam thermal evaporation, and ion-assisted deposition. To understand ion-assisted deposition (IAD), sometimes known as ion beam assisted deposition, it is helpful to first understand the thermal evaporation and electron beam optics coating methods. In thermal evaporation, a block of optics coating material is electrically heated — this causes the release of an evaporating plume of coating material, the individual atoms of which attach themselves to the optical element, eventually collecting themselves across the surface as a thin film coating. The electron beam deposition process is nearly identical, the only difference being that the coating material is not heated by directly exposing it to electricity. Instead, high voltage is applied to a small filament which causes it to shed electrons, which then bombard the coating material with such force that it begins to heat and, again, evaporate. 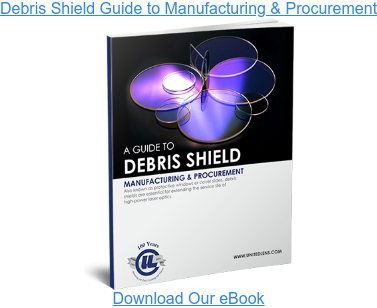 The IAD method is an advancement of thermal and electron beam deposition methods. In IAD, electrical or electron beam sources thermally dislodge atoms from the optics coating material as usual. The primary functional difference is that, as its name implies, a high energy ion beam assists in the actual deposition. The ion beam is aimed at the substrate; when dislodged coating material passes through the ion beam, they absorb its energy and impact the substrate with more force. While standard thermal and electron beam deposition are suitable for many optical elements and their applications, IAD has a number of its own benefits. The increased the kintetic energy of atoms generated by the ion beam leads to a thin film coating with a higher density — this in itself can create more durable coating-substrate bonds and a reduction in required coating materials. Additionally, IAD coating can be used for gradual film-to-substrate transitions and can also help to stabilize properties such as moisture resistance, thermal sensitivity, and extinction ratio. Ion-assisted deposition is one of three deposition methods in which ULC specializes. 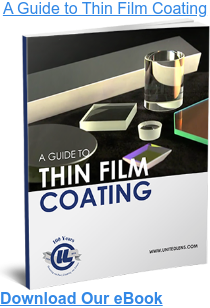 For further information about thin film coating, download our eBook, “A Guide to Thin Film Coating.” In the eBook, you will learn about thin film production, material considerations, properties that can be achieved through thin film coating.